Usually, images like this one are plastered with watermarks or are of cell phone quality but the folks at Lamborghini beat the spy photographers at their game by issuing this swirled-camouflage image of the upcoming Aventador LP700-4. The Italian supercar maker has previously shown off the new pushrod suspension of the Aventador along with the brand new 700 horsepower (509lb-ft of torque) V12 mill from which the LP700-4 gains the main portion of its name, with the “-4” portion pertaining to the advanced all wheel drive system. 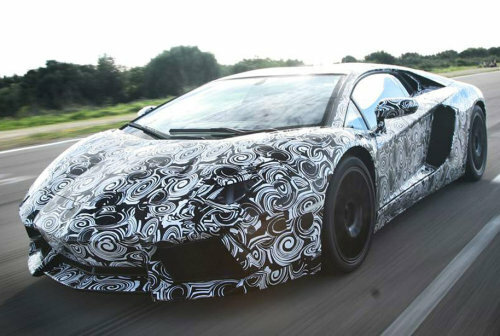 Now they have gone so far as to give us an image of the Aventador LP700-4, although it is heavily masked with the swirly vinyl that we have all become so familiar with but it still gives us a look at what is likely a production-form LP700-4. While the swirled camo makes it hard to distinguish the lines across the front fenders and hood, we get a good look at the massive side-vents that help feed the ultra high performance V12 mounted behind the supercar’s seats. It looks like the rear end is rounded across the top and into the side similar to the outgoing Murciélago with a slippery roofline and some massive side mirrors. This shot also gives us a look at the openings in the front fascia – showing that it has the hard, angular styling similar to that of the ultra limited edition Reventon super-supercar. The new Lamborghini Aventador LP700-4 is expected to effectively replace the Murciélago when it makes its grand debut at the Geneva Motor Show, which begins on March 3rd. Hopefully the beginning of the massive Suisse auto show will give us a good look and full details on this awesome new Lamborghini supercar. Stay tuned to TorqueNews.com for all of your automotive news from around the world!